Defense Secretary James Mattis has called on Defense Department leaders to prepare military options that the U.S. government can use in response to North Korea if diplomatic measures fail, Politico reported Monday. Mattis told the audience at the Association of the U.S. Army conference that current actions against North Korea’s missile and nuclear weapons activities are currently led by diplomacy and economic sanctions. “Now, what does the future hold? 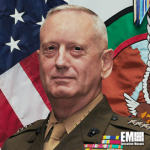 Neither you nor I can say, so there’s one thing the U.S. Army can do, and that is we have got to be ready to ensure that we have military options that our president can employ if needed,” Mattis added. The defense secretary also urged Congress to eliminate budget caps on defense to help maintain the U.S. military’s readiness, Washington Examiner reported. Mattis said at the AUSA conference that the Army and other services should support the move to repeal the $549 billion spending cap for fiscal year 2018 by voicing the need for additional funds to stay ahead of adversaries.